It's time to get excited as Country superstar Kenny Chesney is hitting the highway on his 2016 EPIC 'Spread The Love' Tour! Bringing with him the talented 5 piece rockers, Old Dominion on support! After the huge success of last years journey around North America, Kenny Chesney returns to give fans an experience like never before. With his rich catalogue of 14 gold certified albums including smash hit tracks such as; "American Kids", "Come Over", "You and Tequila"… fans can witness all of this plus more LIVE on stage. To take part in this unforgettable night, roll on down to the Farm Bureau Live on Thursday 23rd June 2016! American Country Singer and Songwriter Kenny Chesney has made a wonderful mark on music history with a successful 20 years and counting! 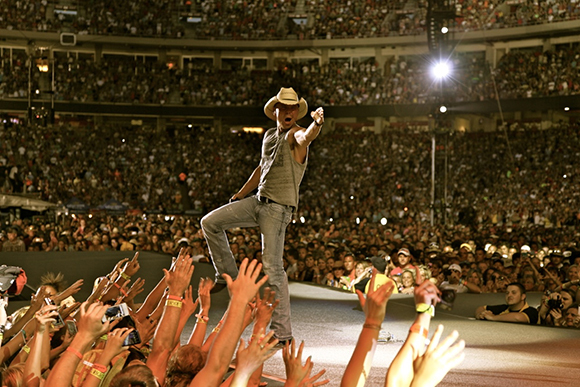 With an outstanding 30 million albums sold worldwide and 28 number 1 hits on the U.S. charts, Kenny Chesney is one of the biggest acts on the scene. His colourful career has awarded him with various titles such as Entertainer of the Year award in 2004, 2006, 2007, and 2008. As well as; Academy of Country Music's 1997 New Male Vocalist of the Year, 2002 Top Male Vocalist of the Year, and the Triple Crown Award in 2005! This incredible recognition has sustained him at the top of his game, giving fans a chance to see him perform live almost every year and now in 2016, Kenny Chesney will embark on his Spread The Love showcase to support his sixteenth studio album "The Big Revival." The record has already received positive feedback, making the hype for the tour bigger than ever, "Chesney overhauls his core strengths, winding up with his best record in years."